This type of conveyors can be used for the transportation of hard-to-break, small-grained and powder-like products, such as sugar, salt, starch, food supplements, ground spices, cacao, ground coffee, instant drinks and other. The product is loaded in the intake bunker of the conveyor, after which, via a transporting auger, the product is moved inside the auger pipe to the set working height. 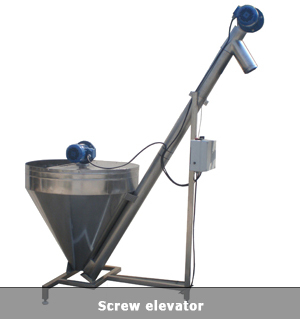 When working with products that have the tendency to clog, the screw conveyor can be equipped with an additional agitator which is mounted in the intake bunker of the machine. 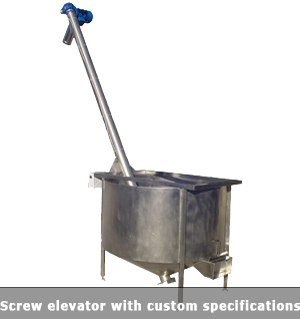 When working with mixtures of powder products, the screw elevators can be equipped with a bypass (reverse) connection, which allows for a very precise homogenization of the product before its transportation. 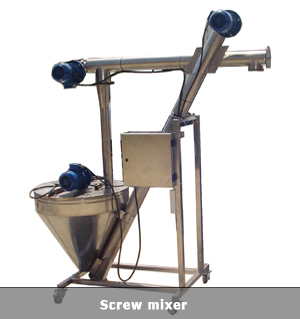 More information regarding the screw conveyors with a bypass connection, or so called screw mixers, , can be found here. The conveyors are manufactured from stainless steel and meet all the safety requirements for working with food products.